I can’t convey how thrilled I am about the upcoming International Birding Rally Challenge in Peru. This is the second version of an event like this in a different region of the country; and this time I will be participating!!! The first Birding Rally covered the Amazon Rainforest of Southeastern Peru up to the environs of the legend-filled Inca City of Machu-Picchu. *See James Curry’s post on the first International Birding Rally Challenge. A Birding Rally Challenge is a unique birding event for its “Non-stop” modality, bringing together the most renowned birding teams competing in a neutral country. Participating teams include the E-Birders from Cornell University, the Tigrisomas from Louisiana State University, the Forest Falcons from Great Britain, the Zululanders from South Africa, Team Tramuntana from Spain, and the Ararajubas from Brazil. 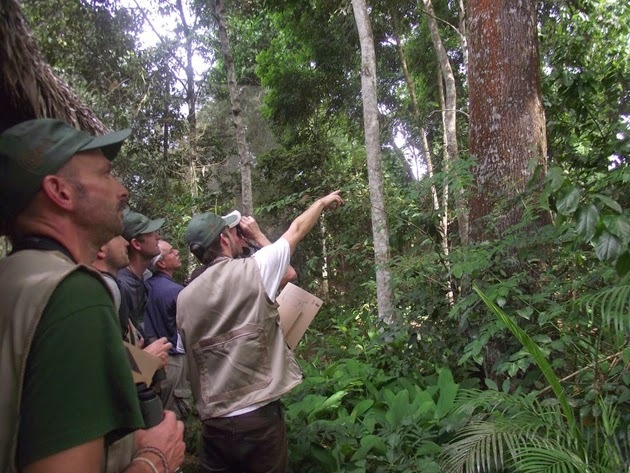 The International Birding Rally Challenge is spearheaded by Inka Terra Association, a Peruvian non-government organization dedicated to research, conservation and community-based ecotourism, Peru’s Ministry of Foreign Trade and Tourism, and Peru’s Commission for Exports and Promotion of Peru. It is expected that an event like this will help highlight Peru as a prime birding and nature tourism destination. World renowned birders will be participating in the second event of its kind in the endemic bird-rich region of Northern Peru. Photo: Inkaterra. With 1836 registered species, Peru is an ideal place to have this competition. This is about one-fifth of all the bird species registered in the world in a country that also encompasses 84 of the 104 recognized life zones in the world. A complex geography and a wide array of contiguous habitats support 120 endemic species, or bird species, only found in Peru. Northern Peru is one of the world’s most important endemic bird hot spot in the Americas. The handsome Buff-bridled Inca Finch is one of five Inca Finches of the genus Incaspiza. All Inca Finches are endemic to Peru. Photo: Jorge Novoa. For birders and naturalists, northern Peru have always been sort of a best hidden secret. It is a little known about and remote region, known to hold some of the most mysterious and sought after birds in dramatic landscapes. Much of what is known about the birds of Northern Peru comes from multiple ornithological expeditions by ornithologists from Louisiana State University, who excited by the hints in the ornithological accounts by early ornithologists such as Melbourne Carriker and Henry Watkins targeted the region for further exploration…and they made exciting discoveries. Interestingly, ornithologists that participated in ornithological expeditions 35 years ago, and other more contemporary explorers, will be participating in the Birding Rally. I Can’t wait to hear stories of exploration and discovery of new species of birds! 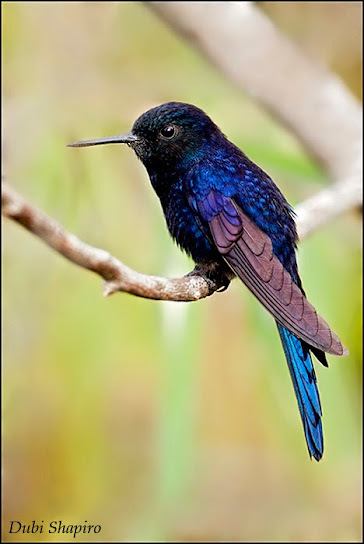 The stunning Royal Sunangel was discovered on an exploratory ornithological expeditions to Northern Peru, not many years ago. Photo: Dubi Shapiro. 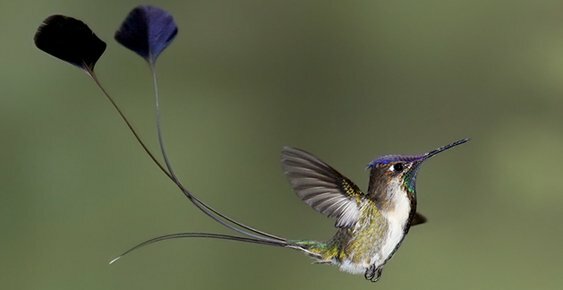 Talking about the birds of Northern Peru invariably gravitates to trophies, such as an adult male Marvelous Spatuletail, whose crisscrossed spatulas bobbing and dangling around its body as the bird hovers at flowers. 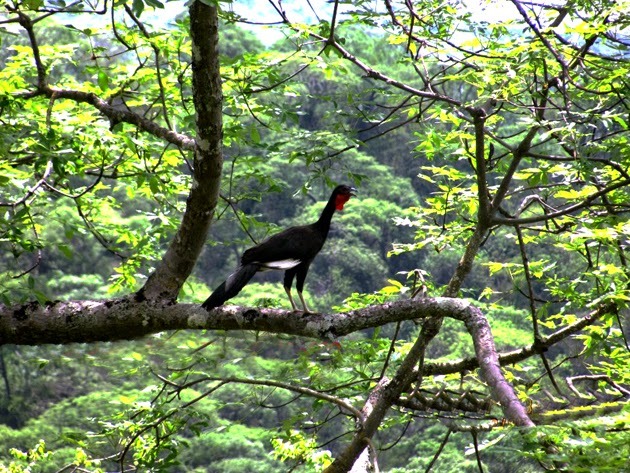 Others include the White-winged Guan, whose white primary feathers are so different from the mostly dark members of the genus Penelope; the Guan was thought to be extinct for almost 100 years, until its recent rediscovery. More recent discoveries include a new species of Poecilotriccus, known as Johnson’s Tody-Tyrant. Thought to be extinct for many years, the White-winged Guan can now be seen within about two hours of a mayor city in Northern Peru. Photo: Fernando Angulo. 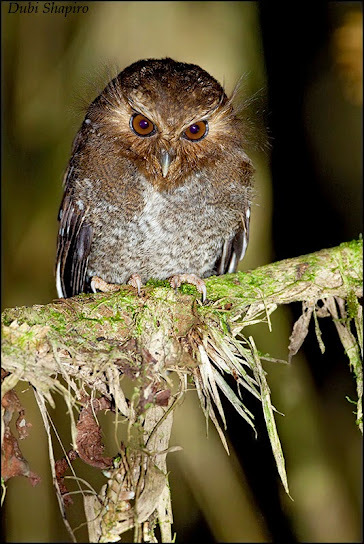 As recent discoveries goes the mythical Long-whiskered Owlet was discovered the night of August 23, 1976, but not seen again for many years even with considerable efforts to find them. It has only been seen out of a mist-net in natural conditions the year 2007 and after the creation of an ecolodge in the owlet’s prime habitat, the mystery of the Long-whiskered Owlet has been resolved. The recent construction of strategically located ecolodges and hotels have made possible that regional specialties such as Ochre-fronted, Chestnut, and Rusty-tinged Antpittas, Inca finches of the genus Incazpiza, Chestnut-backed Spinetails, and many other ovenbirds, flycatchers, tapaculos and a plethora of electrifying tanagers be easier to access than it was just a few year ago. 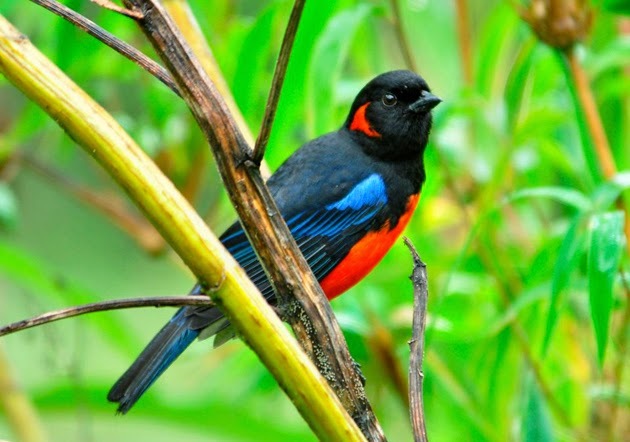 The Scarlet-bellied Mountain-Tanager and many other colorful members of this colorful family are found in Andean humid forest. Photo: Alex Duran. There is a long list of birds along the altitudinal gradient going from the western coastal lowland of the Tumbesian deciduous forest, treeless grasslands over the Andes to the lush rainforest along the foothill of the east-facing slope of the Andes. Going over the Northern Andes of Peru does involve high thin-air elevation passes. The Andes here does not feature snow-capped peaks, but the relief is rugged with a unique scenic beauty. Mountain chains here have been carved by rivers over millions of years, resulting in deep canyons and long stretches of vertical cliffs. This region was also inhabited by ancient cultures and evidence of their existence can be seen as statues perched on inaccessible cliffs or cemeteries of the ruling class. The most prominent canyons along the route of the be Birding Rally Challenge are the Maranon and Utcubamba, which constitute geographic limits to the distribution of some species and hold endemic species restricted to these valleys themselves. 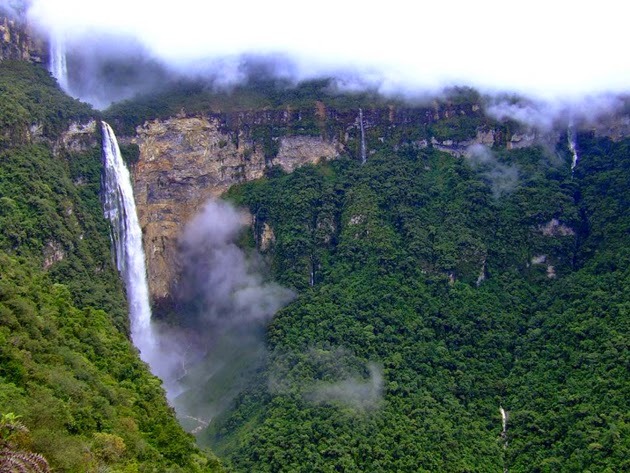 At 2,530 ft tall the Gocta Falls shown in this photo, is the world’s third tallest waterfall and it is found in the Utcubamba Canyon in Northern Peru. Photo: Inkaterra. I look forward to return and write about what went on the International Birding Rally Challenge; I hopefully will be part of the winning team!!! Good luck! You will have fun even if you don’t win. Clare and Grant, so true. it is going to be a lot fun. Not only about the Rally itself, but also what it means and folks involved!! Glad to see that you will be participating Al. I hope your team wins! Can’t wait to read about the rally. Thanks Pat, I now know I will be with the South African Team….the Zululanders. As things go, a Peruvian birder (from the host country) is assigned to each of the participant teams. I think we have pretty good chances to win, although other teams have very experienced Neotropical birders. We’ll see…one thing though it is going to be fun! It is going to be tough, but the Zululanders have recent gen and made a time trial. The LSU and the Cornell teams will be the toughest competition and they have very experienced members. We’ll see what happens. I will be following the event closely on daily basis – and hope to blog almost every day on Birdingblogs.com.